End of the Year photo album for 4th Grade! click on the link below to view photos from the year! On the day of their presentation, students need to have their artifacts and food dish. Each student will need 50 "Costco Sample" size portions of their food item. When parents come for the museum, students will be standing at their desks and parents can walk around to view each student's project. Please feel free to contact me with any questions. Thank you so much for squeezing time out for your child to work daily on ST Math. We have reached another classroom goal! Our class on average has made it to 80%! ​Please take a minute to share this post card with your child! Since this week and next week will be a short weeks for students in school, our Reading Routine and Spelling Routine will be stretched for 2 weeks. This means our Spelling test will be moved to Friday, April 6th. Friday we had a guest speaker from the Audubon Education Outreach which the PTA Grant program helped pay for this year. Students learned about Watersheds that are small and where they start! They start in higher elevations and flow down to low elevation. They drew watersheds and placed them together to create large water sheds. We have MontCAS testing for Science coming up in 2 weeks. Fourth grade will be taking the test March 13th and 14th. This is a lengthy test and we will be doing it in 3 sessions that last about 90 minutes each. If you would like your child to have gum during this test, feel free to send it to school. It’s that wonderful time of year again … Dr. Seuss's Birthday ! A sombrero, baseball cap, or even a beret…it’s “Wear any kind of hat” day. Wednesday, February 28th If I Ran The Zoo “That’s the gol-darndest lion I ever have seen!” It’s “Wear any kind of animal print” day. direction you choose.” It’s “Wear a shirt that you got shows you traveled somewhere” day. Thank you so much for providing so many boxes and additional supplies from home to may our dioramas a HUGE success! They turned our GREAT! We are now setting our sites on the 1 party we get to have a year. Our Valentine's Day Party will be on Feb. 14th along with all of Arrowhead. Since that is a day we get out at 2, we will start our party at 12:45 and go until 1:45. Please feel free to send Valentine's Day Cards starting Monday, February 12th. We will be making Valentine's bag at school next Friday for the students. If your child has a box that they have created at home, you may send that to school next Monday as well. Please remember we have 2 children with peanut allergies so please double check any candy choices to make sure they do NOT include peanuts. Thanks you in advance for helping make our party a success! TOYS for TOTS collection starts NOW and runs through December 8! Nov. 13 - 17 Unit 2 Week 4 Spelling test has been moved to Monday due to the Music Tour and not having time to get all activities done at school. 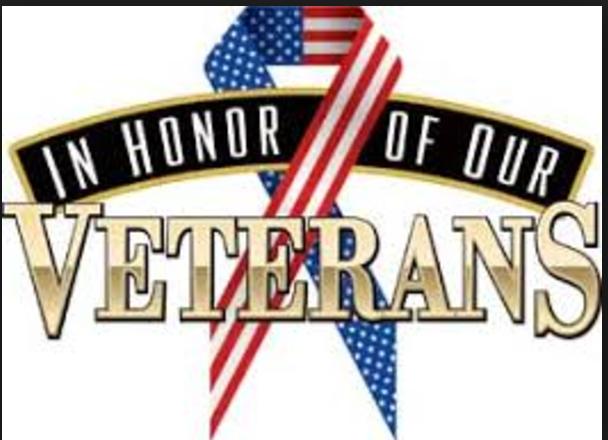 Friday, November 10 at 8:45 4th and 5th Grade General Music Veteran's Day program. Repeat attire on Monday, Nov. 13th for our "On the Road Tour"
Our class has chosen the theme of "Games" for our auction basket this year. Money from the basket auction is used to purchase different reading programs and pay for things like Brain Pop, Scholastic News, etc. If your family is able to donate anything to our basket that would be wonderful! Thank you for your support! If you have other game ideas, please feel free to send them to school. The auction will take place during Family Fun Night on October 28th. Please send all our basket items in by Tuesday, October 17th so that we have time to put the basket together and then have it displayed starting on Monday, October 23rd. Thanks so much!! I am also looking for someone to help put the basket together, please let me know if you are interested. Reminder our fundraiser for the year is coming up! Next Friday October 6th is the Fund Run. Please plan to be there if you can to cheer on the runners, or better yet, sign up atwww.freshschools.com and volunteer to help out! We need adults set up around the courses to help guide the runners and cheer. Kindergarten, 1st, 2nd, and 3rd graders will run a half mile route starting at 1:30. Log on to www.freshschools.com and click on the “fundraisers” tab, or log onto the Arrowhead website www.arrowheadelementary.weebly.com and click on the “donate now” button. Send a check to school (payable to Arrowhead PTA) in the envelope provided last week in the Tuesday folders. If you need another, there are more available at the office. Please also let grandparents and friends know about the run so they can sponsor as well. The PTA and all the students thank you! Ms. Waddell and the 4th graders will present a Veteran's Day program on Friday, November 10th at 8:45 AM for all parents. Please mark your calendars for this Thursday to attend our Open House from 6 to 7. Teachers will be doing 2 presentations both about 25 min. 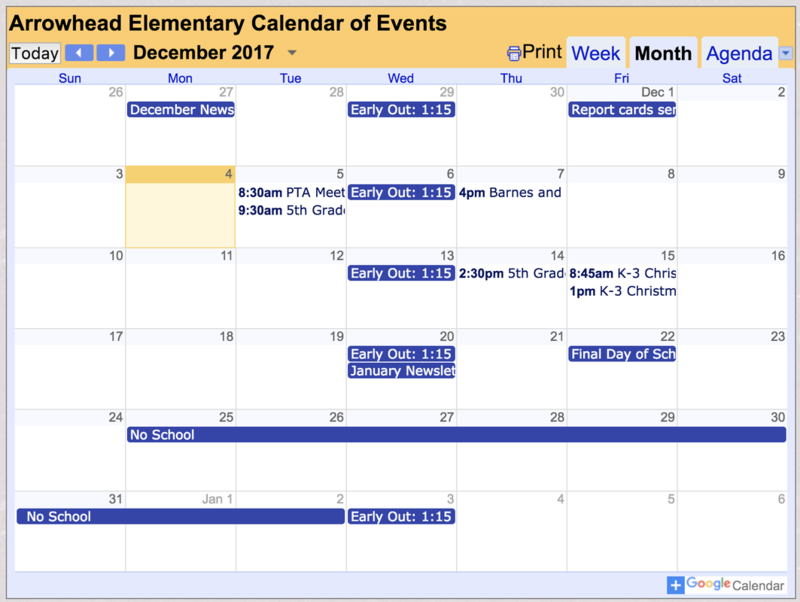 so you may attend a second child's classroom presentation if you need to. If you are unable to attend, please email me and I will send you a link to my presentation. Ice Cream Social with pizza and inflatables! The school with the most runners will win $250. Mr. Pertuit would LOVE to spend this money on more PE/recess equipment!! Professional Learning Communities (PLC’s) for teachers. 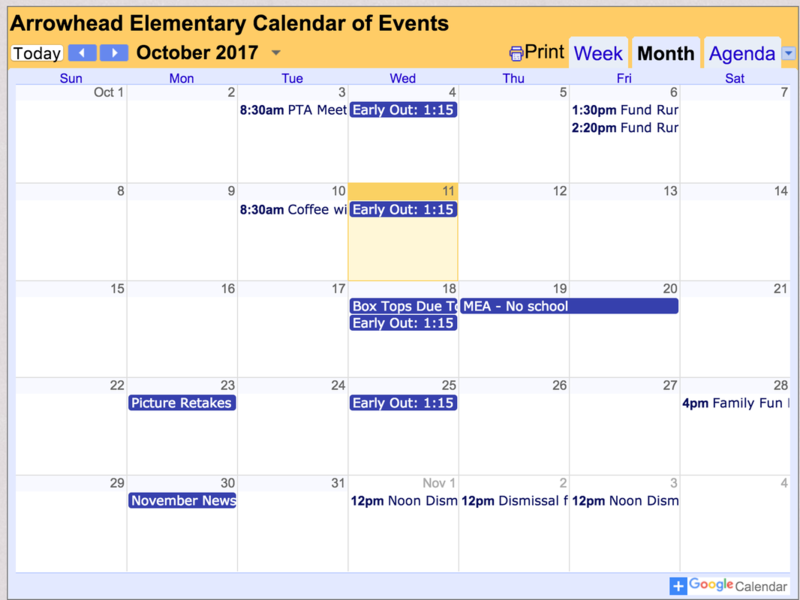 Reminder that Wednesdays this year we will be having early releases at 2:00 for 4th & 5th graders and 1:15 for Kindergarten - 3rd grade. Hello, my name is Maggie Fagan. I have had the pleasure of teaching grades K-6 for over 20 years in Billings. This is my 8th year at wonderful Arrowhead Elementary School. EMPOWERING STUDENTS TOACHIEVE GREATNESS AND LEADERSHIP WHILE ENSURING HIGH LEVELS OFSUCCESS FOR ALL! I wholeheartedly embrace our vision and strive to deliver varied learning experiences, hands-on learning discoveries, and a love of learning to your child. My goal is to develop independent learners who have a love of learning that will last a lifetime. Away from school, I'm the mom to Lute, recently graduated, and Shania, a Senior at West High. My husband Grant and I love spending time with family and friends and taking walks with our two puppies Lily & Kaia. Our newest addition is a kitty named Shuffle. He loves to chase both puppies around our house and keeps us all smiling. I am so looking forward to meeting you at our "Meet the Teacher" night on Tuesday, August 22nd from 2:00-3:00. This a a great chance to bring in all your supplies, meet me, and get familiar with your new classroom! 22: “Meet the Teacher” from 2:00-3:00; bring school supplies and meet your teacher! 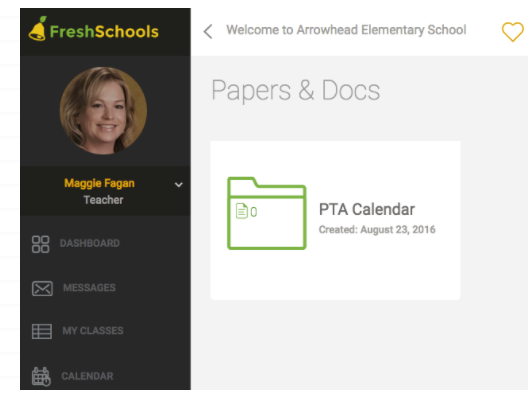 "Fresh Schools" - Classroom & PTA communication for parents.